A woman who says she was racially assaulted on a London bus has called for transport companies to keep CCTV material for longer, after footage of her attack was deleted in just 10 days. Makedah Simpson reported the incident to police immediately but the case was dropped due to a lack of CCTV evidence. Ms Simpson, 23, has launched a petition calling for firms to keep footage for 30 days, attracting 140,000 signatures. Transport for London said CCTV material was kept for as long as possible. Currently companies can set their own timeframes for holding footage. Violent crime: Is it getting worse? 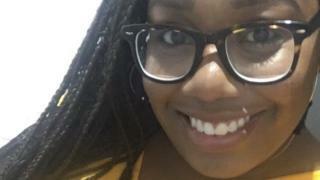 Ms Simpson was boarding a bus near Victoria Station in central London in March when a man shouted racial abuse and shoved her, injuring her shoulder. She said she reported the assault to police through an online form, providing her Oyster card number, and was contacted by officers the following day. But because of an error recording some details, the recovery of CCTV footage from the bus company was delayed. She was then told that the company only kept footage for 10 days and it had been overwritten. The case was subsequently dropped due to a lack of evidence. The Met Police said they were not able to obtain the CCTV footage because Transport for London (TfL) records showed the Oyster card had not been used at the relevant times. However TfL confirmed Ms Simpson had used her Oyster card correctly and said they had been provided with the incorrect bus route and date by police. Ms Simpson, from south-east London, said the attack had left her hesitant to go out and she had changed her bus route to work because the incident had taken place nearby. She also said the experience of reporting the crime had initially made her "lose faith in the criminal justice system". "At first I was angry at putting myself through that and nothing happening," she told BBC News. "And then I thought how many other people must have gone through this, and how many people might not know about the time limits." She decided to start a petition to help others in a similar situation. "As a victim you feel rushed and under pressure to relay the information correctly. This change would allow people the opportunity to report crimes and also have the space to deal with whatever has happened to them," she said. "In my case, there was a delay because of human error, but in other cases it might take longer to recover CCTV or people might not report something straight away." She said the response to her petition had been "overwhelming". "As a victim you can feel so alone, but to know there's 140,000 people behind me saying this is something that has to change is so powerful," she said. A spokesman for the bus operator, Metroline, said CCTV was kept for 10 days, as required by their contract with TfL. And Tom Cunnington, head of bus business development at TfL, said the attack on Ms Simpson was "completely unacceptable". He said that while it was not currently possible to keep footage for 30 days, the company ensured all buses stored CCTV material. And as technology improved, they would make sure it was kept for as long as possible. The Department for Transport refers operators to guidance from the Information Commissioner's Office's code of practice. It advises that the Data Protection Act does not specify a minimum or maximum time CCTV footage should be kept and only says it should not be kept for longer than necessary.